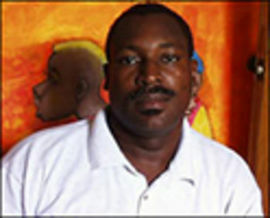 At the age of 11, Yordan Dabady began professional studies in ceramics and art under the tutelage of Fritzner Mervil and Diedonne Cedor at the Salesian Brothers School and then two years later, in 1975, Dabady was granted a diploma in painting, which certified that he had the acquired the ability to paint in any artistic medium. After his course of study, for the next six years Yordan Dabady was employed at the deVendegies workshop as a decorator, but he eventually was promoted to the position of chief decorator. However, the owner and Yordan were involved in a disagreement, so the young decorator left the workshop and begin his career as a real artist. 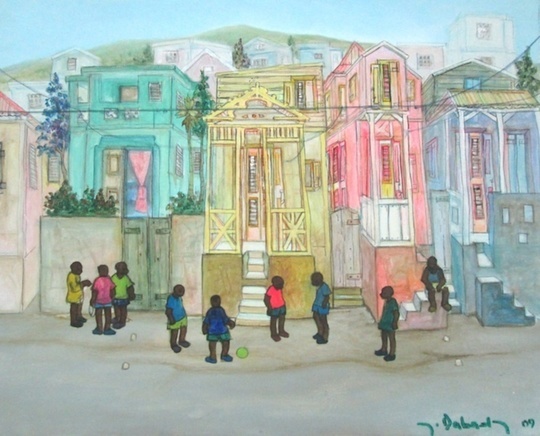 The first paintings of his career phase were created in a “gingerbread” style of pastel colors in lighter and darker shades surrounding the main colors of his motif and these were motifs that were presented to the more popular local galleries: Monnin, Marassa, Nader, Touche d’Arte and Galata and from 1990 until 2005, Yordan Dabady exhibited his work in many galleries throughout Haiti. 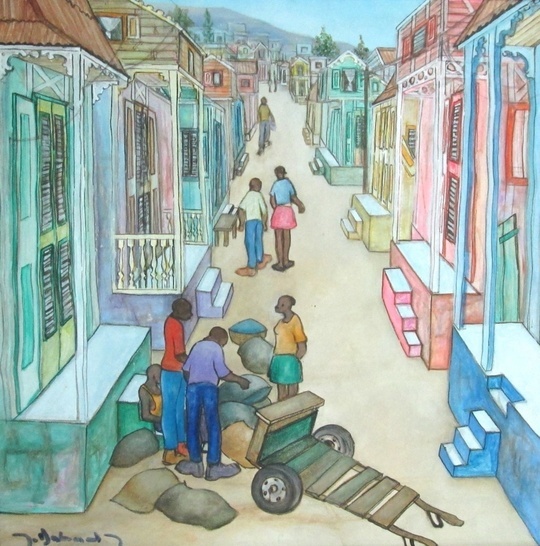 His artistic style has developed into a somewhat abstracted form of Naïve art and his thematic renditions are rather childlike yet appealing depictions of a variety of subject matter displaying daily urban life in Haiti, portraits, landscapes, the history of the island and the ancient religion for many, Voodoo; his genre scenes have included the depiction of children playing in the park, the local barber shop, making a simple meal on the side of the street, the marketplace and church. 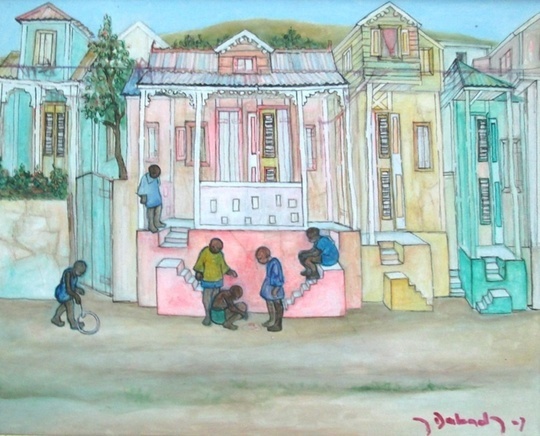 Dabady’s imagery often represent the figures wearing mismatched shoes, socks and clothing as a statement of the poverty in Haiti and people are forced to wear whatever is available. The Checkers artist painting depicts two boys in the middle of a checkers game with an older woman standing behind the checkerboard looking intently at the moves, whereas an older man stands behind the woman and checker players taking in the game. The artist checkers theme is portrayed in a domestic scene that represents a daily leisurely activity amongst Haitians and Dabady has depicted the checkers game in a relaxed and pleasant mood; the local people are portrayed within the composition in a contrast of soft, muted tones blended with bold colors of the clothing; the figures are created in cartoon like shapes yet their postures and simple expressions still convey a realistic scene and serene atmosphere and time of fun surrounding the checkerboard and moves of the two opponents. 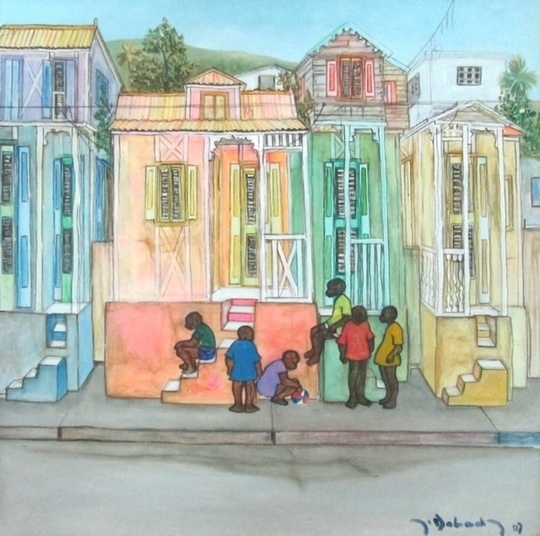 Yordan Dababy’s genre scenes of Haiti in their simplicity of style and bold, yet subtle palette, these motifs represent the culture of an impoverished island in the same way that the game of checkers depicted life from the artist’s honest perspective; his statement in this pervasive theme is clear as much in these depictions as in the two boys playing a quiet game of checkers on the front stoop.